While we’ve been hearing a lot the past few days about the decision to cast Ben Affleck as Batman in the upcoming Batman vs. Superman movie, what about DC’s decision in the 1990s to replace Bruce Wayne with the psychotic Jean-Paul Valley? The latest installment in my Gimmick or Good? 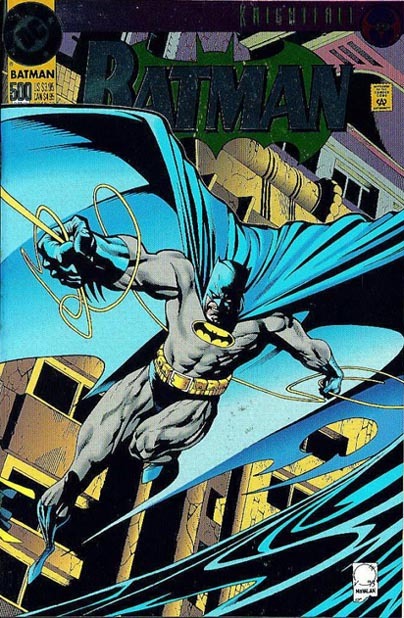 series at CBR’s Comics Should Be Good Blog is Batman #500, which focuses on Jean-Paul’s first major battle as Batman after he replaced Bruce when his back was broken by Bane as part of the “Knightfall” arc. The cover gimmick includes a chromium embossed die-cut cover. Did I think the comic was gimmick or good? For all my Gimmick or Good? articles, click here.